Oki, who was guest on a radio programme, Morning Digest on Lagos Talks 91.3Fm hosted by veteran journalist, Jimi Disu, monitored by our correspondent, said the duo had approached him to discuss the plot, challenging them to come out publicly to state their own sides of the story or deny such discussion ever took place. “I think they (Aregbesola and Oshinowo) should be manly enough to come out to say what the Governor has done that they are not happy with. It’s not by keeping the man in the dark and not telling him exactly what it is and then carrying hosanna in the day and crucifying him at night, they should be manly enough to come out,” Oki said. He also blamed the duo for the crisis in the party in the State, saying that they were hell bent on ensuring that they had their way and take control of the party. “Anybody trying to bring Bola Tinubu into this matter is unfair. 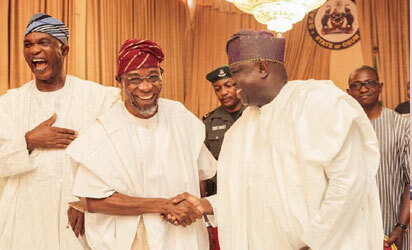 Really if there are personalities in the issue, it would have been Governor Aregbesola and Hon. Bayo Oshinowo who on their own decided that everybody must be roped into line by joining by fire by force the mandate group. And because they have their issues with the current State Governor and because of that they have made up their mind on what the likely result of party primaries would be and if they issues with Governor Ambode they should not bring it or situate it within the party process,” he said. When the presenter asked if he (Oki) had any scores to settle with Ambode, the embattled factional chairman of the party in the State bluntly refuted, describing his relationship with the Governor as cordial. Oki explained: “I don’t have any reason to say this is what the man has done against me. The last time we met, Prince Tajudeen Olusi, our leader invited me to meet Asiwaju with him to discuss some issues at Bourdillon. While we were there, the Governor came in and we all greeted and when the Governor got to me he said, “Egbon ma fe no yin pa ni”, then about five minutes after Prince Olusi came in and myself and Prince Olusi were going in to meet with Asiwaju and then the Governor saw me again and call me and we exchanged banters again. Oki however said his major grouse was the alleged illegality perpetrated during the APC Congress in the State, which produced Alhaji Tunde Balogun as Chairman of the party. He stated that as a grassroots man he had a formidable following behind him against the party bigwigs who do not want to enthrone internal democracy in the APC. He revealed that his group had gone to court to seek interpretations of the constitution and the party’s byelaws concerning holding primaries in 57 LGs and LCDAs instead of 20 LGAs only. He also warned that if the matter was not settled amicably, APC may not field a candidate in the 2019 gubernatorial election. The post Aregbesola, Oshinowo working against Ambode’s second term – APC factional Chairman, Oki reveals appeared first on Vanguard News.